How magnificent are the colors of fall! Just look at the leaves turning orange, brown and yellow, falling gently from the trees. 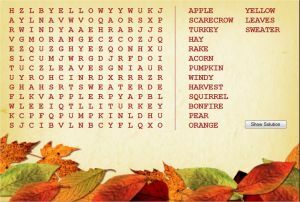 Let's find the following fall (autumn) related words in the puzzle: apple, scarecrow, turkey, hay, rake, acorn, pumpkin, windy, harvest, squirrel, bonfire, pear, orange, yellow, leaves and Sweater. There is no other holiday like Halloween - the masks, the spooky stories, and so much candies! 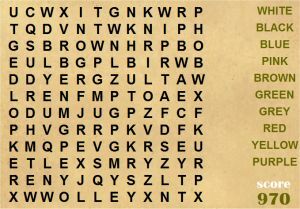 Challenge your word search skills with this special Halloween puzzle. 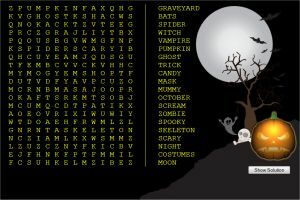 Let's find the following Halloween words in the puzzle: bats, moon, trick, candy, spider, ghost, graveyard, vampire, pumpkin, mask, mummy, October, scream, zombie, spooky, skeleton, scary, night and costumes. 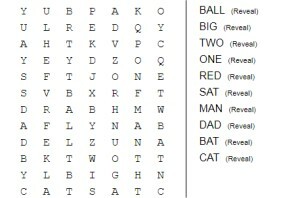 Can you find the hidden president names inside this word search game? 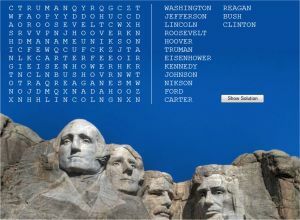 Played to the beautiful scene of Mount Rushmore, this is relatively an easy puzzle, where answers can be found written from left to right, top to bottom or diagonally. This game is suitable for 1st grader and advanced preschoolers who can read basic words. The words are short and common, such as: Ball, Red, Bat etc. The words can appear from top to bottom, and from left to right. It is hosted on the wonderful spelling training website, where you can edit the words to look for, shuffle the grid again, and actually hear every word that you find. 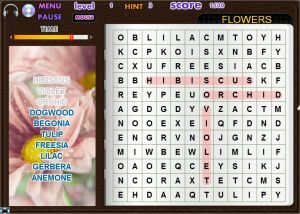 This word search game uses a 12X12 grid for all its levels. The words are hidden in the grid in two directions only: From left to right or from top to bottom (not diagonal and not backwards). The topic is chosen randomly for every level from a big variety of topics. It could range from physics to flowers, photography, naval, law, trees, math, drama and many more. Every level is time limited, so it might be challenging for the younger. 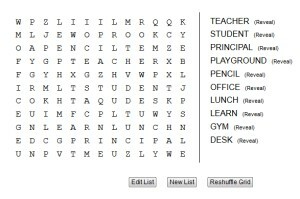 This word search uses school themed words such as Desk, Library, Ruler, Student, Teacher, Book, Computer, Principal etc. When you find a word in the grid, click its first letter and hold down the mouse button. Drag all the way to the last letter and release the mouse button. Words found correctly will be crossed out from the list. The grid is quite big, but don't worry - it isn't time limited, so you can calmly search and find all the words without a haste. Clothes, Animals, Sports, Colors, Fruits, EU Countries, Disney, Hockey, Twilight & Movies. When you find a word, press on the first letter of it and drag the mouse all the way to the last letter of it, then release the mouse button. The grid used is 12x12 giving it an intermediate difficulty level. Words can appear in any direction: From left to right, right to left, top down and bottom up, and also in diagonal directions. The above puzzles can be used by teachers with their elementary school students to enhance their word recognition & perception. All of the activities are accompanied by detailed instructions and can be played online, directly from your browser. The puzzles are mostly easy, with no time limit, and include "hints" and "reveal word" options for the case the kid gets stuck and doesn't manage to find the target.